Happy days are here again, at least for the sellers of multimillion dollar homes. After four solid years of penny-pinching, the rich are opening their pocket-books to buy real estate. Cash sales are on the rise. Sales of multimillion dollar homes and condos are up in all 20 major U.S. metro areas, some of which have seen double-digit increases in high-end home sales. What's behind this buying spree? When Wall Street fares well, sales of high end goods usually follow -- luxury autos, boats, planes, and even $8 million homes. And prior to Japan's nuclear and earthquake disaster, Wall Street had been on a roll. Even though Wall Street bonuses were slightly smaller last year, they still averaged $120,000. Luxury real estate is enjoying bargain-basement prices: $600,000 is the new million, according to Alex Villacorta, senior statistician at Clear Capital. Spurred by extreme price reductions, New York saw million-dollar-plus home sales volume grow by 25 percent. Agents in Los Angeles and Washington, D.C., saw sales of high end homes spike by 20 percent. 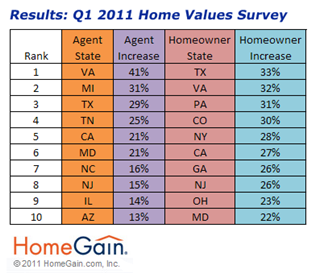 Other gainers include Honolulu (26 percent), San Diego (14 percent) Nashville (13 percent) and Dallas (1.5 percent). The rich are also getting richer. CEO bonuses at 50 major corporations jumped 30.5 percent, the biggest gain in at least three years, according to a study of the first batch of corporate CEO pay disclosures by consulting firm Hay Group, as reported in the Wall Street Journal. Under the new financial over-haul laws, investors have their say now in every business whose stock-market value exceeds $75 million. Investors were quite generous to execs at Starbucks, Jabil Circuit, and Clorox Co. What do they do? Buy real estate. According to DataQuick Information Systems, after four straight years of declines, sales of million-dollar homes and condos rose by 18.6 percent in every U.S. market. The biggest market for million dollar homes was, no surprise, San Jose, Calif. With all those Silicon Valley gad-zillionaires around, San Jose home sales spike 27.4 percent. Underwater-world Phoenix saw the smallest jump at .04 percent. But here's the weird thing: Home sales outside of this glitzy price range actually declined. "It hasn't been a good six months for all people, but it was a good six months for rich people," said Glenn Kelman, CEO of Seattle-based real estate brokerage Redfin. Economists, like Bankrate.com's Greg McBride, say higher income households are feeling better about their financial security and taking advantage of bargains in expensive first homes. Second home sales are also on the upswing. Martha Johnson, a seasoned broker in Big Sky, Montana, says multi-million dollar sales at Spanish Peaks, the luxury golf and ski community smack next door to the Yellowstone Club, with private ski mountain and lifts, have picked up dramatically: three transactions since February include a $4.8 million ski in/ski out home, the most expensive land sale in two years, and a $1.9 million developer cabin right on the golf course. As for bottom-feeding, Johnson says prices are down by about 4 to 5 percent. It was even cheaper to get a jumbo mortgage for jumbo homes. Jumbo loans finance any mortgage beyond the $417,000 threshold; $729,000 in higher-cost cities such as New York and almost the entire state of California. These loans generally have higher interest rates because they are considered higher risk, and not backed Fannie Mae or Freddie Mac. In 2009, jumbo loans cost 1.8 percentage points more in interest than the average loan; in 2010, they were only 0.6 points more. Think that's peanuts: A wealthy home buyer would save save about $780 a month on a million-dollar mortgage -- enough for a luxury car payment. Luxury auto sales, by the way, are also on the rise. Let's get real: what does this mean for those of us without $120,000 bonuses? Should this trickle down to get us shopping, too? Maybe, if we can afford to. Even Lawrence Yun, chief economist for the National Association of Realtors, advises basing home purchasing on affordability, lifestyle choices and home preferences, not investment. Tread carefully, because many out there still think prices may dip further. Karl Case, one-half of the famous Case-Shiller housing report index, thinks the market will "bounce along the bottom all year." His gloomier compadre, Robert Shiller, has said that home prices may crater 20 to 25 percent this year. Other experts say stable areas, he says, such as Texas and the Midwest, will probably not experience price plunges at all, but other markets could. You may get a bigger discount by waiting a year, says Dean Baker, co-director of the Center for Economic and Policy Research. He thinks home prices will drop 10 percent or 15 percent. 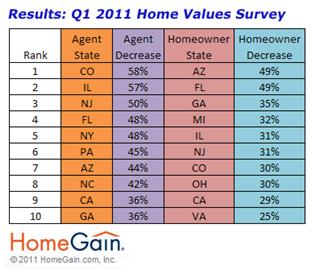 Some real estate professionals and homeowners agree. According to a nationwide first quarter home value survey over at HomeGain, 39 percent of agents and brokers, and 30 percent of homeowners believe home values will decrease over the next six months. Only 17 percent of agents expect home prices to increase in the next six months, which is slightly more optimistic than last year's 12 percent who thought this way. Lower unemployment numbers could make everyone a lot more positive.